This week, I talked a lot about how fiction can help fulfill those dreams we knew were a bit far-fetched. But what about dreams we've actually achieved in the real world? I mentioned that one of my dreams as a teenager was to to live in Africa. When I was in college, I decided that was one I was going to fulfill. I'd saved up a ton of money for a study abroad, but in the end I didn't go with a school program. I picked a volunteer organization that set me up with a host family, a project, and I bought a plane ticket and flew to Africa alone. Not going to lie, I kind of freaked out when I got there. But it was the best four months of my life. I spent my days teaching English to the nursery class at New Life International Orphanage and School. I'd grind my teeth in frustration when the kids chattered in their native language through the lessons, then exclaim in joy when one boy managed to actually sit his little hiney on a bench and trace the letter A. After school, I'd spend a few hours in the afternoon wandering the streets to make friends, reading at the beach, or washing my laundry by hand. I'd spend my evenings playing games with my host siblings or talking politics and herbal medicine with my host parents. I'd spend my weekends crossing bridges set hundreds of feet high in the rain forest canopy or following a trail guide to find elephants. I fulfilled that dream, and it was one of the most amazing experiences of my life. So, my friends, what dreams have you fulfilled? What adventures, big or small, have you had that you look back on with fondness? What dreams are you still hoping to fulfill? What an amazing dream to fulfill! You must have the most incredible stories from that time. Writing a book has always been my dream (of course). And I'm so close to being done! WOW! This is one of my yet to fulfill dreams. Maybe not live there, but go and help. We have a relationship with an orphanage in Nirobi, Kenya and my dream is to go and help out, even if it is for just a few weeks. It is so wonderful that you were able to do this. Shallee that is incredible! I can't imagine what that would of been like. Amazing in so many ways. What an absolutely wonderful dream to fulfill! If you haven't written on this in the past (in which case, could you link me to it?) you definitely should. I'd love to read more about it. A dream that I'd like to fulfill is going back to college! I'd like to finish my Japanese degree and, with any luck, teach English in Japan one day. Oh, and be published of course! Amazing dream to fulfill! I wish I could go to Africa! My dream was to go to college and I did but not until my fifth daughter was two and I was in my thirties. Caitlin, I have written a few things about it. 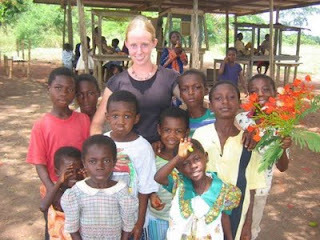 You can click the tag "Ghana" at the top of the post, or check out http://prayersfromafrica.blogspot.com/. I haven't posted there in ages, but there are a lot of backposts with my experiences in Ghana! Shallee - What an amazing journey that must have been. Kudos to you for having the determination to make your dream happen! I have a missionary friend in Kenya now on one of many yearly trips. They usually buy a cow for a village and build some showers/restrooms and homes. My thing I remember is writing and directing a Christmas play with 15 kids & 3 adults here in Norway and in the Norwegian language - even the song "mary Did You Know" was in Norsk. That was a challenge.